We tested the effectiveness of synthetic and natural antimicrobials. Today we separated food dye using filter paper. The lighter the dye the farther up it traveled. Biotech 2 is getting started on their DNA fingerprinting lab. We have crime scene DNA and 5 suspects. Stay tuned to find out who did it. I have a couple of subspecies of Stapelia hirsuta, or starfish flowers, currently growing in my backyard. Different flowers attract pollinators in different ways. Moths are generally attracted to white, fragrant blossoms. Bees like a nice landing pad with nectar lines to guide them in. This flower attracts flies. It does this by emitting a foul odor, much like that of rotting flesh. This nauseating smell permeates the air within a five foot radius of the plant. 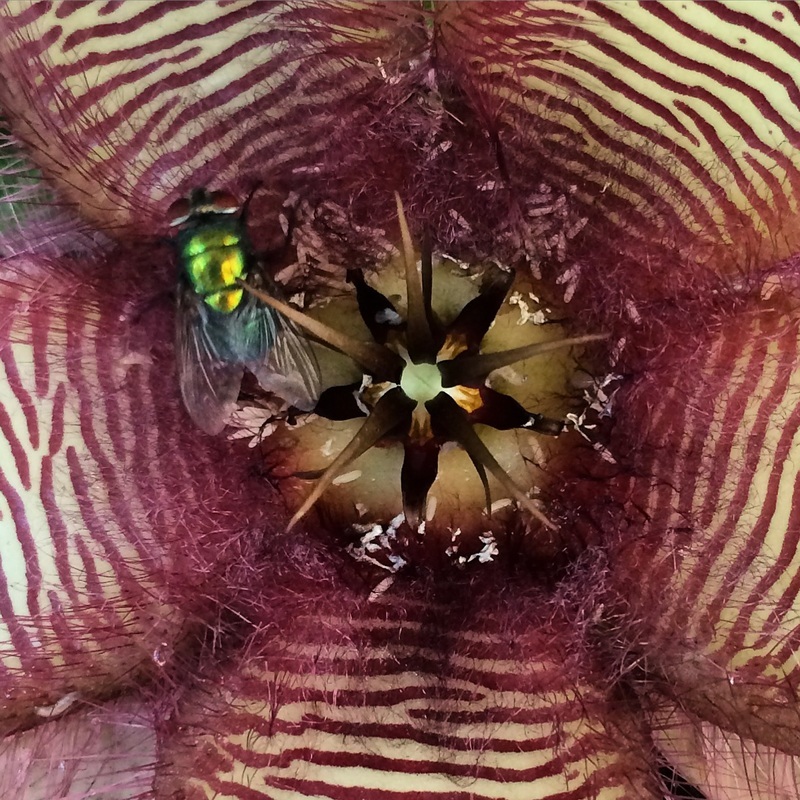 It mimics the smell of rotting flesh so well that flies have deposited eggs in this flower. The picture on the right shows the larvae. Some are wriggling about, while others still seem to be encased. I doubt the larvae will survive as there is no real meat on which to feast on. Silly flies. Update: Here's what it looked like the next day. The flower has wilted and the larvae are strewn about and dead. Biotechnology 2 performed their dye electrophoresis today, here are the before and after pictures. The dye migrated toward the positive electrode, indicating that the dye itself is negative. The heavier blue dye did not travel as much as the yellow, indicating that it is heavier than the yellow dye. Lipid test was positive, indicated by the red stained fat molecules floating at the top. Glucose test was positive, the indicator went from royal blue to a pale green color. Starch test was positive, indicator changed from dark brown to blackish-purple. Setting up "Murder and a Meal" lab. We're setting up for Biology's "Murder and a Meal" Lab. Students will be testing "stomach contents" to determine what our victim's last meal was. We will do this by testing for the presence of various macromolecules. Featured here: Mrs. Blake's set up. Mrs. Husselstein's blog on activities going on in class and beyond.